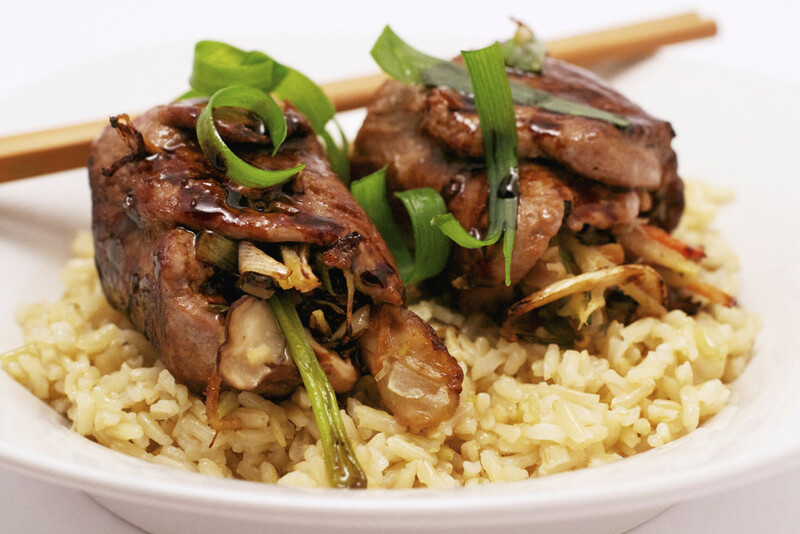 Moo Shu Pork Rolls - What the Forks for Dinner? When I was a kid, I thought ordering Chinese food seemed so romantic and big city……..eating out of cartons with chop sticks while saving the world! Glory be…………. we have a Chinese restaurant……..was the first thought that came to my mind when living in my first apartment. I could live out that fantasy of my youth. Well, the food was awesome, came in those little boxes……….and I never have mastered chop sticks! Now a-days, I make my own Chinese food. 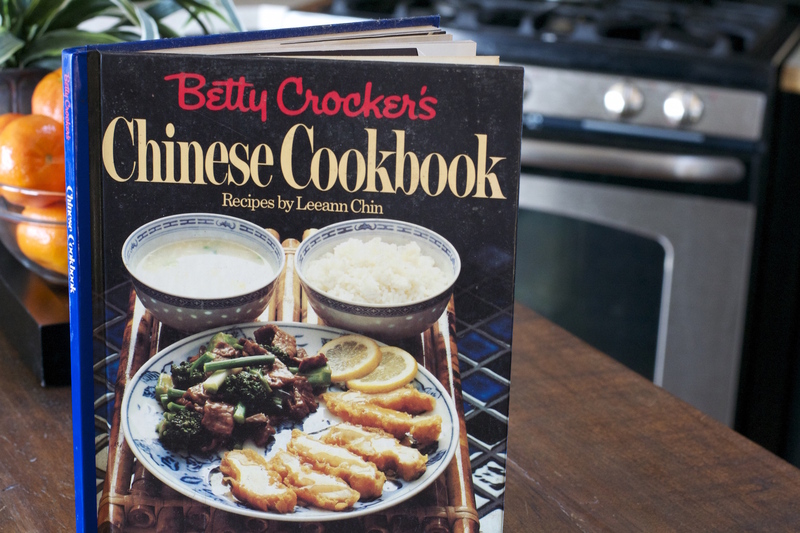 I have a cookbook from my fav Betty Crocker, that is all Chinese cooking. You can tell how much I have used it by all the stained pages, and you can tell my most favorite ones as the book naturally falls open to those pages. My absolute fav is the Sweet and Sour Chicken……but that is for another day. I have no idea why, but Moo Shu Pork sounded good. In my Betty Crocker book, the Moo Shu Pork has the Mandarin Pancakes…………kinda like a crepe and something I have yet to master. So no Mandarin pancakes. But I didn’t want to just do a stir fry……oh no. I need to be fancy pants about it……lol. 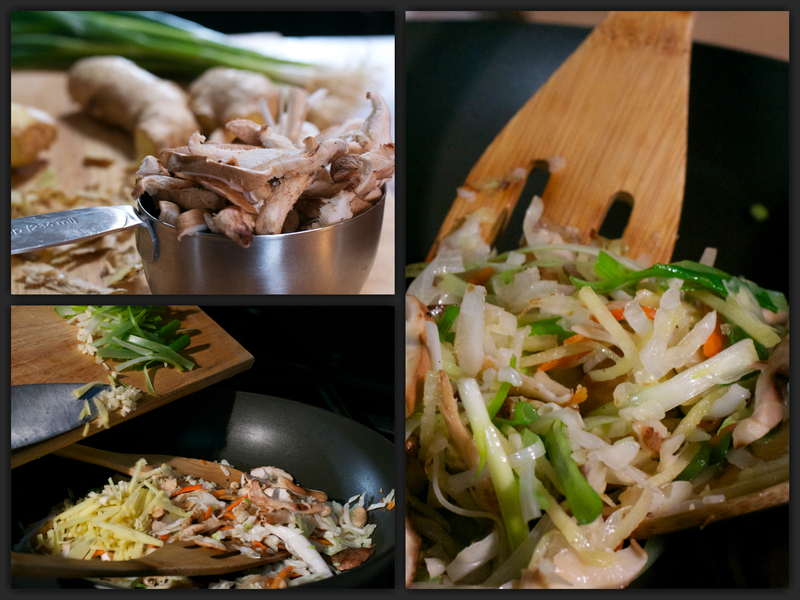 In my tribute to fancy……..Moo Shu Pork Rolls….ta da!!! Ok, maybe not the fanciest thing ever, but pretty looking and in the words of Rachael Ray….yummo! 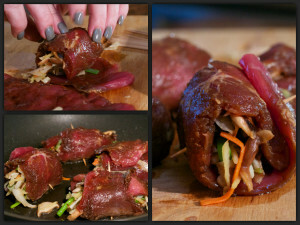 Although it looks at little time consuming, it really isn’t……..while most Chinese cooking is slightly time consuming. It’s all the chopping that takes time, not the actual cooking. Since I really am kinda lazy sometimes, I buy thing that do not require a lot of extra prep. But they are more expense you say…….I say you cannot put a price on time….so there! For this recipes I bought pre sliced mushrooms, and packaged cole slaw mix. The rest was a quick chop, some green onions, garlic, and ginger. 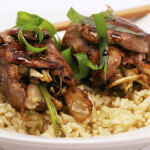 I pounded pork tenderloin into thin pieces, and placed them in a marinade of soy sauce, sherry, brown sugar, and sesame oil. I let them marinade while chopping the veggies. A quick stir fry of the veggies. Roll the veggies up in the marinaded pork. Quick sauté in some coconut oil (check out our What the “Forks” Healthy? page for more info on coconut oil) and placed on a bed of rice…….you know cause I can’t make the pancakes….yet! I reduced the marinade to use as a sauce. If you use a marinade for this purpose, please be sure to really boil it to make sure it is safe to consume. The reduced sauce drizzled over the rolls and rice…….Moo Shu Pork Rolls! 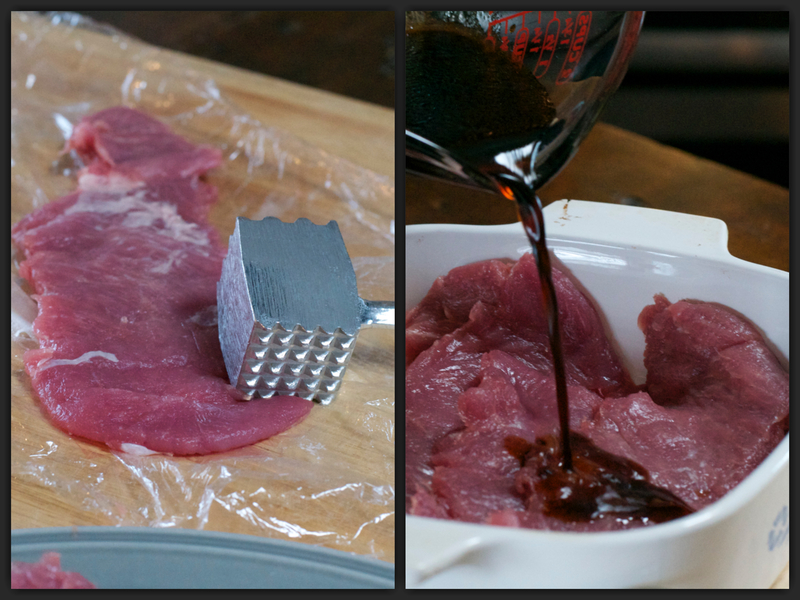 Place pork, soy sauce, sherry, sugar, sesame oil, and salt and pepper in a small bowl; toss and set aside. While pork is marinading. Heat peanut oil in a large skillet over high heat. Add ginger, scallions, slaw mix and mushrooms; cook, stirring and tossing constantly, until vegetables are wilted, about 5 minutes. Remove pork from marinade and set marinade aside. Place pork on cutting board and divide vegetable mixture evenly among pork pieces. Roll up securing with a toothpick. In a skillet over medium heat melt coconut oil and sauté rolls until meat is cooked through.Remove rolls from pan and cover with foil to keep warm. Pour marinade into same skillet and bring to a boil. Continue boiling until reduced until thickened. To serve place one cup of cooked rice in a shallow bowl on or on a plate. Place 2 roll atop rice and drizzle with sauce. Garish with green onions if desired. This recipe is for two but can easily be doubled.